A one year-old baby boy we know was in the hospital this week, with double pneumonia. It is a scary time for his brave parents, who are by now totally sleep deprived, I am sure. The puppets are each praying in their own way for this little boy. After hearing the news about our friend’s son, M. began to tell me about his childhood bouts (plural) with pneumonia. He was so sick that he was left listless, skinny and uninterested in food. After his second bout of pneumonia, his mother took the proverbial bull by the horns and moved him to a health resort in the Uludağ mountain area for several months so that he would regain his health, and most importantly, M. tells me, his appetite. 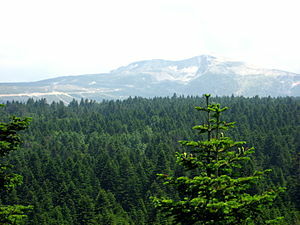 The Ulu mountain – or Uludağ (ooh-loo-dah, the g is not pronounced) is the ancient Mysian Olympus, a mountain in Bursa Province, Turkey, with an altitude of 2543 m (8343 ft), per Wikipedia. M. and his mother spent a good long stretch of time out of Istanbul there – the idea was that the high level of oxygen in the air would jump-start his appetite – and eventually, it did. This entry was posted in Cross-cultural learning moments, Visits from the Karagöz puppets and tagged Bursa, cross-cultural, health, Karagöz and Hacivat, Ottoman Empire, Pneumonia, Uludağ. Bookmark the permalink. J and I think that most Turks have a hypochondriac gene! Around here they don their winter clothing on a set day in autumn regardless of how warm and sunny it is. Suddenly all the men look like Queen Liz at Sandringham driving a tractor! I bet they catch most of their ailments through sharing closed down, steamed up public and private transport with other spluttering/sneezing/wheezing “Gecmis olsun”ing fellow sufferers who stuff themselves with self-administered anti-biotics and potions. None of the shops stock icecream in winter because it makes you ill – certainly makes me ill when I fancy a Cornetto!! Turks do seem to be mildly obsessed with keeping draughts at bay which is perhaps why houses are hermetically sealed without air bricks or other means of ventilation even in steamy bathrooms. We dread the approach of the mould season! Babies are so wrapped up (even in summer) they look like fat little grubs. Speedy recover to the little boy you know.